SACRAMENTO, CALIFORNIA (The Nil Admirari) - A small group of anti-vaccination Californians stood outside the California State Capital today to protest a bill that passed the state Senate and will prevent them from being lethally stupid members of their community. 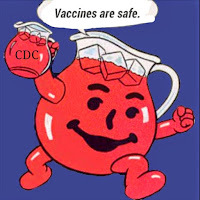 Specifically, SB 277 will remove the personal beliefs of parents as an exemption for a child to be vaccinated against diseases like measles, which protesters claimed violated their freedom. "Who else is going to reintroduce deadly diseases that would otherwise be eliminated if I no longer have the freedom to prevent my children from being vaccinated against them?" asked Betty Cross, who held a creative sign depicting a child being stabbed by twenty syringes. An anti-vaxxer misuse of an American icon (above). The freedom to do their children, and those of others, harm seemed to be a right all of the protesters felt they were entitled to. "I dream of an America where I have the choice to allow my children, and those of my pro-vaccination neighbors who have children too young to be vaccinated, to die of easily preventable diseases like measles," said Jack Herald, a father who claimed the MMR vaccine resulted in his oldest son having autism. All of the anti-vaxxers in attendance stated the scientific evidence in support of their position was "irrefutable," which showed they understood science as well as they understood vaccines.